Found 2 file extension associations related to HaftiX and 1 file format developed specifically for use with HaftiX. 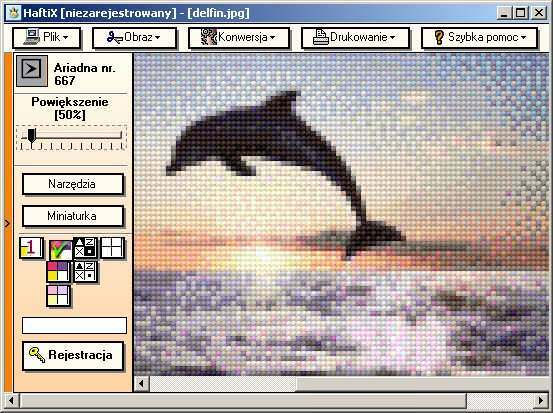 HaftiX is a computer application which allows transforming any picture, image or photo into cross stitch pattern (a chart). Thus you can quickly prepare your own, unique diagram along with a legend. The application shows how the ready-made cross-stitch will look like. It is equipped with easy to use and helpful edition tools, it minimizes the number of colours, calculates the use of threads and their cost, creates patterns from colours selected by the user, prints them, etc.. It has a database of embroidery floss: Ariadna, DMC, Anchor, Madeira, Puppets and Anchor tapestry wool. If you need more information please contact the developers of HaftiX (Grzela Grzegorz Zochowski), or check out their product website.